When imagining a visit to Italy, two opposing visions may enter your mind. One is likely of the iconic colosseum heavily featured in Hollywood movies and a star of history books. The legendary events and ceremonies that occurred in such a grand venue and other like ruins scattered across the city of Rome and other parts of Italy still baffle the mind. The second vision is the quiet, beautiful rolling hills of the countryside scattered with stunning farmhouses, orchards and vineyards. Many of the homes are large houses built for entertaining and joining large families together. This is the setting of the origin of Tuscan design and inspiration for the decor of your local Olive Garden. What the two visions have in common is intricate and beautiful craftsmanship that utilizes the natural materials abundant in the area and the admirable craftsmanship of the time. 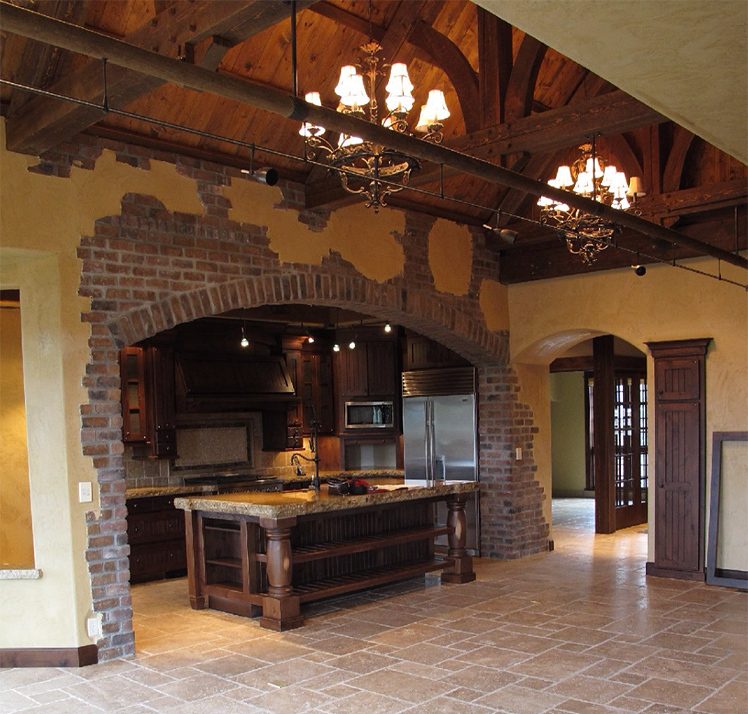 Tuscan design is meant to imitate and recreate elements of homes located in Tuscany and surrounding regions of Italy. The design focuses on the use of natural, muted colors and materials. Highlights of this design are lumber, stone and often stucco on the exterior. Exterior colors generally range from a medium-dark to light brown, some burnt orange tints and occasionally a muted yellow. Original buildings in Tuscany often have the exterior stone of the structure revealed on the inside as well. Builders typically sought materials that were most easily available to them to build their homes quickly which often resulted in the use of rough stones found near the surface of the ground. It is no longer common practice, nor economical to build residential homes of stone, but the aesthetic can still be created by the use of stone veneers of various sizes and color varieties. Before proceeding with any stone addition to the home it is important to meet with an architect to determine whether the surface area can withstand the weight of the stone, what needs to be done to enable it to do so and possibly what materials would be ideal for your structure. The home pictured below has many Tuscan elements; from the exposed brick, dark stained wood, iron chandeliers to the travertine tiles. Wood elements in a Tuscan home will be finished in a way that mimics their natural luster and not shiny or heavily lacquered. Boasting some of the largest forests in Italy and some of the most sought after lumber, it is no surprise that Tuscan homes also make an impact. The wood in Tuscan homes appears aged and darkened with time which can be accomplished with newer woods by applying a wax stain. Common wood types include oak, walnut and beech, among many others, which are hard woods that dot the vast Tuscan landscape. 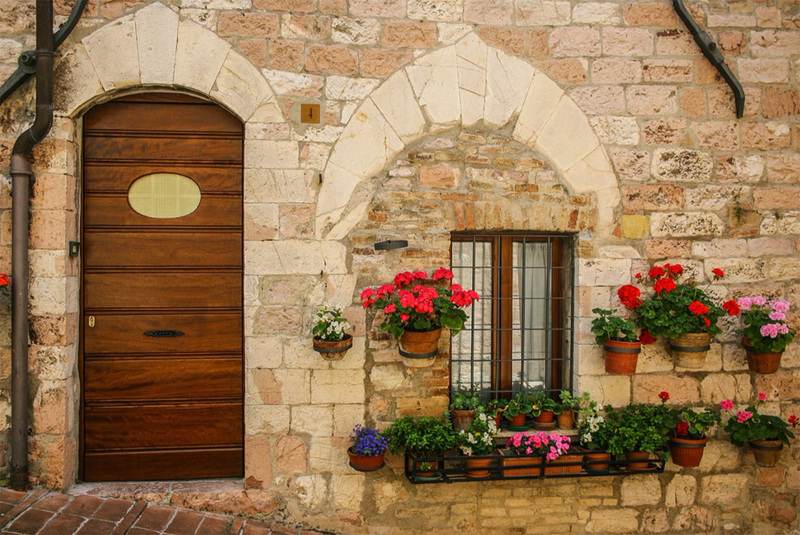 In traditional Tuscan architecture, wood was used primarily indoors for furniture, doors and as ceiling beams but little was seen on the exterior. You’ll notice the use of travertine tiles extending from this kitchen. This natural color plays into the palette of natural, light hues. Traditional floor and roof tiles were made of terracotta, a brownish-red material. Italy is famed for the high quality clay available for ceramic artists. As previously mentioned, builders were often looking for materials that could be found and manufactured quickly to build their homes so another common element is brick, one of the oldest building materials manufactured by man. A final detail that will help to cement your home as an authentic Tuscan representation is the use of metal and iron hardware. Iron details inside the home, such as door pulls and lighting and outside, like the Juliet balcony pictured above, take the home to the next level. 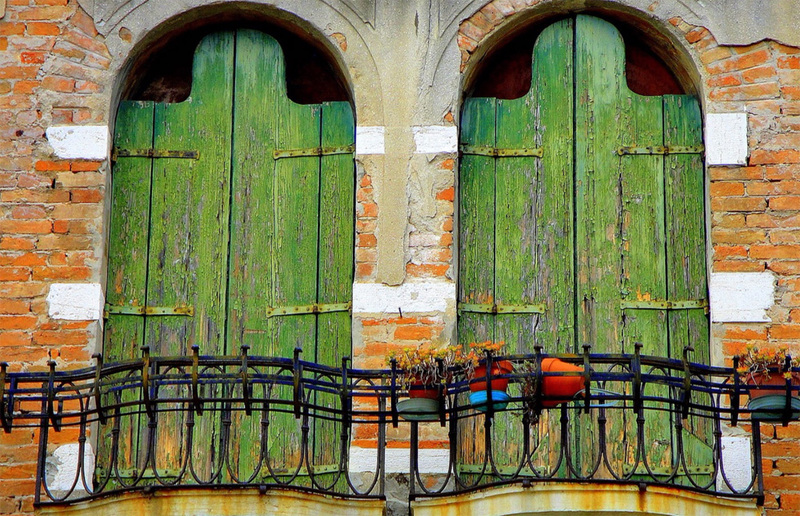 Many patinas and finishes can be used to accomplish a Tuscan feel, but stay away from anything too shiny or busy. Tuscan decor creates a classic look that is sought after by many and likely to be in style for years to come. Remember, bringing elements of a style into your home does not restrict you to that style alone. Feel free to play a round with color and textures, and most importantly, introduce items that are meaningful and representative of you.